In the glassworks where OERTEL products are created, the craftsmanship of classic glass and the expertise of glassmakers is passed on and refined over generations. Since 1869, the best glass makers, polishers, engravers and painters have worked for OERTEL and this ensures that every single piece of crystal is its own masterpiece. 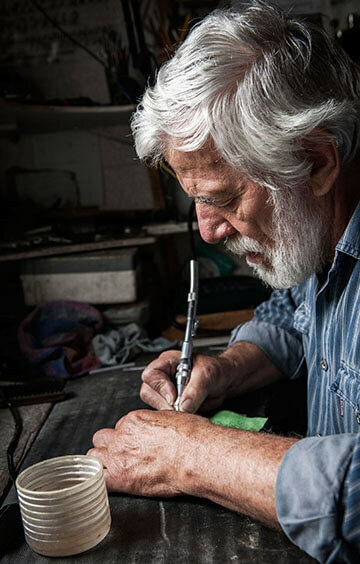 Many of our skilled workers – many with us for decades, some in their fifth generation with OERTEL – contribute their vast knowledge and experience to the exquisite collections and individual pieces of OERTEL. OERTEL crystal is still made ? ?entirely by hand. It begins in the glassworks; turning the shapes in wood, blowing the glass, modelling the stem and hand assembling. Our glass polishers, engravers and painters work in the old tradition; each piece is hand sanded, engraved, polished and painted. The product-finish has always been OERTEL’s great claim to fame. In 1887 the method of adding colour ornament to hollow glass objects was registered as a patent by company founder John Christian Oertel. The specific techniques and procedures for cutting, engraving, sandblasting and painting, which OERTEL have maintained since then, are still used today for the refinement of a crystal unmatched and unique in the world. The simple basic components of sand and ash form a molten fluid destined to become virtuoso handmade works of art – individual crystal handmade masterpieces, each distinctive in design and manufacture.